THIS EVENT HAS BEEN POSTPONED DUE TO DIFFICULT WEATHER CONDITIONS. REFUNDS WILL BE PROCESSED FOR THOSE WHO HAVE PURCHASED TICKETS. PLEASE STAY TUNED FOR INFORMATION ON RESCHEDULED EVENT. As reimbursements shift from volume based to value based, healthcare organizations are becoming more responsible for providing the resources necessary to meet the needs of a given population. Aligning quality of care with the appropriate level of care and services becomes pertinent to healthcare organizations’ bottom line. It is imperative for healthcare leaders to develop programs that offer undeserved communities an opportunity for a healthier tomorrow. Developing population health management into a tangible measure continues to be a challenge for all healthcare organizations across the country. 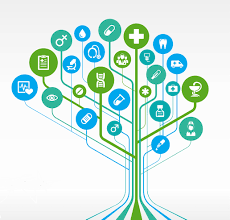 How to properly reduce costs while improving the quality and access of care in communities that lack the resources and education to care for themselves and prevent acute health issues and substantive chronic disease continues to be a major hurdle in population health adoption. When: Tuesday, February 5th at 6PM. 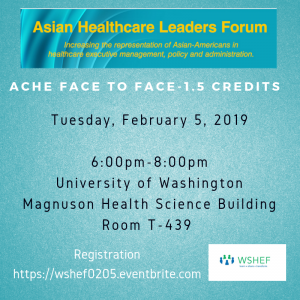 Where: University of Washington, Health Sciences Building: Room T-439 (T Wing). Please plan to park in the S-1 (pay attendant) or E-19 (self serve pay) lot. Parking will not be validated by AHLF.